So in "In The Shadows" I have a problem where while everything is in 3D (most of the things) my camera is orthographic to get the 2D pixel art look. It makes for a weird situation since I need to fake the different layers moving like there was perspective even tho everything is 3D. Losing the perspective really makes it a 2D game, both in the visual and the code. Since I'm kinda new to game dev in general, I look for lots of help online and often don't find simple example of what I'm looking for. Sometime it's for really basic stuff so I thought maybe I can share some of the things I figured out, even tho it must be pretty obvious to developers with years of experience. I have a bunch of layers in the game. 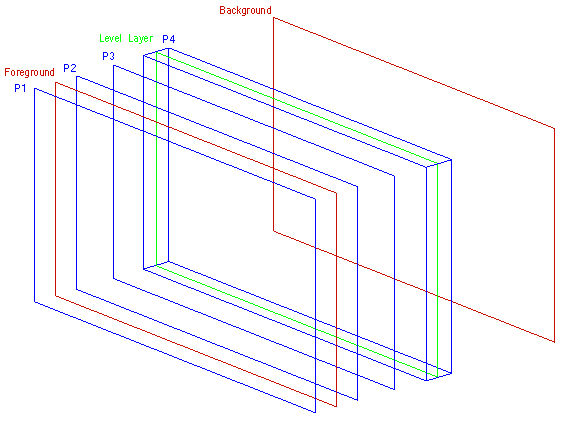 The level layer is the static one where the player move around. The background layer is a slow offset image. I got 4 different 2D particles layers. P1 to P3 are 2D. P1 is in front of the tiles forground layer, P2 and P3 are inbetween foreground and level layer, slightly spaced out and all 3 moving at different speed compared to the player movement to simulate the perspective. I then got a fourth layer, P4, which is a 3D container of particles. This one I can keep like this since it doesnt move around, and the fact that it has a depth makes for particle to be in front of and behind the main level layer. So thats pretty much it. Nothing too fancy.